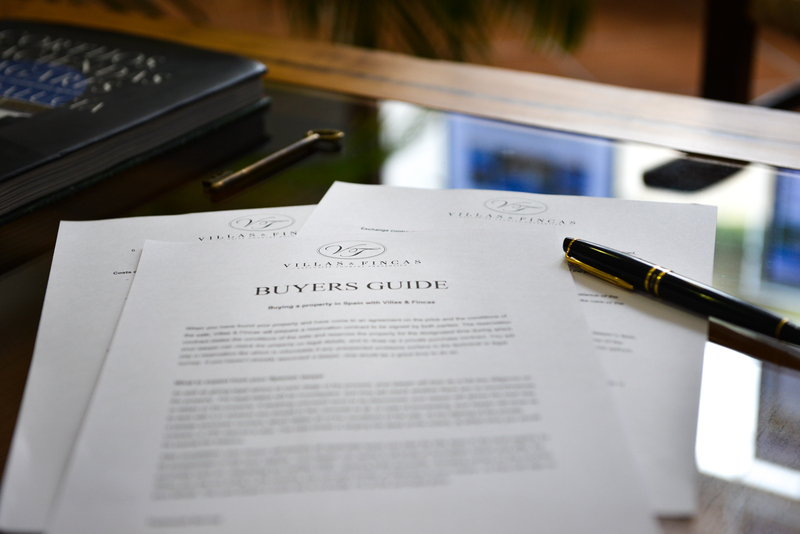 When you have found your property and have come to an agreement on the price and the conditions of the sale, Villas & Fincas will prepare a reservation contract to be signed by both parties. The reservation contract states the conditions of the sale and reserves the property for the designated time during which your lawyer can check the property on legal details, and draw up a private purchase contract. You will pay a reservation fee which is refundable if any unexpected problems surface in the technical or legal survey. If you haven’t already appointed a lawyer, now would be a good time to do so. As well as giving legal advice at each stage of the process, your lawyer will then do a full due diligence on the property. The legal status will be investigated, and they will check whether there are no encumbrances or debts on the property. If anything untoward were to be discovered, your lawyer will advise the best way to deal with it or whether you should, in fact, proceed at all. In case of proceeding, your lawyer will draw up a private purchase contract, which states all of the conditions of the sale. At the signing of the private contract, a 10% deposit is due. The next phase is singing the deed at the notary, at which time you would be paying the balance. After completion, your lawyer will declare all applicable taxes and take the title deed to the land registry for its incorporation in the land registry. Your lawyer can assist in all kinds of formalities before and after the purchase such as: requesting tax number (NIE), opening bank accounts, changing names on the contract. When you are not living in the country, you can give Power of Attorney to your lawyer, so they can sign on your behalf. The cost lawyer’s costs are normally 1% of the purchase price. It’s probably common in your home country to request a technical survey on the house you want to purchase. We always advise to doing so in Andalusia as well. With the offer accepted and the reservation contract signed, the next step is to sign a private contract, which states all of the conditions of the sale. This usually happens within two weeks from the offer being accepted and is where your lawyer really starts to earn his/her money, by conducting surveys and making sure there are no outstanding debts or problems attached to the property, for which you may be liable. At the signing of the private contract, you will be required to pay a deposit of 10% of the purchase price. Final completion takes place signing the Title Deed before a notary and you pay the balance of the purchase price. The signed deed is lodged with the land registry and your lawyer will take care of the remaining formalities such as payment of the relevant transfer taxes. Transfer tax: in Andalusia, it is currently 8% over the first 400.000€; 9% over the amount between 400.000€ and 700.000€; and 10% over the remainder. For furniture, the transfer tax is 4%. Lawyer fees: roughly 1% of the purchase price. Fees for a technical survey. Administration fees for changing over contracts for utilities. Bank costs for banker’s drafts and transfers. Each year, real estate owners must pay IBI, which is a tax issued by the local council for all property owners. If you are purchasing a resale property, your lawyer will ensure that you are given copies of previous receipts as proof of past payments. If you are a non-resident in Spain, as a property owner, you still have to declare a non-resident-income tax (Impuesto de la Renta de No-Residentes IRNR). The yearly tax is calculated on the cadastral value of your property. If you rent out your property you can declare the rent here as well and deduct rental costs. If the net value of your property exceeds 700.000€, you will also be charged for wealth tax. This tax is supposed to be abolished again soon. Our service to our clients does not stop after the sales. Many of our clients ask our assistance to find a cleaner, gardener or property manager. Many are also interested in doing larger or smaller reforms in their new homes. We collaborate with professional architects, builders and interior designers to make sure that your dreams come true. If you have bigger plans with your plot, want to landscape or even plant an olive grove or vineyard; we also put you in touch with the right partners to bring those projects to a good end. Also, for simpler questions, our clients can always contact us. Where to buy, where to find a good restaurant, where to go with children; we will happily share our knowledge with you. It is important to prepare for the purchase as much as possible in advance. Choosing the right professionals to handle the sale is essential. Knowing all of the costs and taxes in advance is particularly recommended in order to avoid unexpected costs after the purchase. Villas & Fincas will assist you in all negotiations. We will confirm all conditions in writing to both parties to prevent any misunderstanding. Make sure you have 10% of the purchase price in place. If you need a mortgage, please make sure you have a pre-approved mortgage with one or two banks. When your financial position is strong, it’s easier to make a good deal. If there is furniture included in the deal, there will normally be a payment for the house and another for the furniture. Normally, a purchase can be completed within 60 days, however, three months is more common if a mortgage is needed. Villas & Fincas has assisted many clients with the purchase, we hope to assist you with this exciting journey of the purchase of your dream property, it will soon be time to celebrate your new home! Please note this is a guide only. For legal and fiscal matters, we advise you to contact a specialist to assess your personal situation.